To see ways of inspecting your hotel room for bed bugs see the link below. Bed Bugs are about 3/16″ of an inch long (about the size of a small watermelon seed). Their bodies are broad, oval, flat and are brown to reddish-brown in color. Bed Bugs live where we live. We are their soure of food. Search the following areas for them: mattresses, bed frames, bedside tables, headboards, molding, picture frames and much more. Look for blood stains and black smears on fabrics and the bed frame. They hide during the day and come out to feed at night. You may not see the actual bug, but the evidence can be very visible. The number of Bed Bugs found in the Magic Valley is rising at an alarming rate. They arrived about 10 years ago. Slowly increasing until recently, they have exploded in number. Their mode of moving from one location to another is as simple as kids visiting another home that has them, going to a hotel or motel that may have them, buying used furniture or electronics. The paths they may take to find their way in, are endless. While traveling, inspect beds and bedding in hotel or motel rooms, travel bags and clothing. Look for the bugs and/or evidence of them. At home, be vigilant in inspecting beds and bedding. The best path to ridding your home or business of Bed Bugs is with a professional treatment. 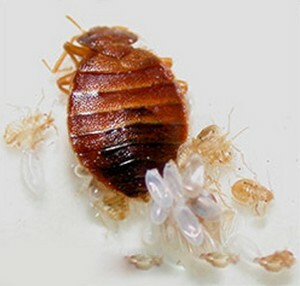 We at, Cook Pest Control, can help in the control of Bed Bugs in what ever situation you may find yourself in. Our technicians have the training and experience to thoroughly address your Bed Bug problems. Don’t waste your time or money on over the counter products. Call Cook Pest Control for an inspection and information to aid you in Bed Bug issues. CLICK HERE TO SEE INSTRUCTIONS TO BE PREPARED FOR A BED BUG TREATMENT! You can inquire at (208) 733-0800 or by filling out the form at our Order Services page. Contact Cook Pest Control to handle all of your home or business bed bugs extermination, rodent control, animal removal or exclusion and ALL your pest control needs in the most effective and responsible way possible. Cook Pest Control is proud to serve Idaho in all the Magic Valley, most of the Wood River Valley and Mini- Cassia County areas. We serve Acequia, Bliss, Bellevue, Buhl, Burley, Castleford, Eden, Elk Horn, Filer, Gooding, Glenns Ferry, Hagerman, Hailey, Hansen, Hazelton, Heyburn, Hollister, Jerome, Ketchum, Kimberly, Murtaugh, Paul, Picabo, Rogerson, Rupert, Shoshone, Sun Valley, Twin Falls, and Wendell.